» Are Vanilla Reloads At CVS Coming To An End? 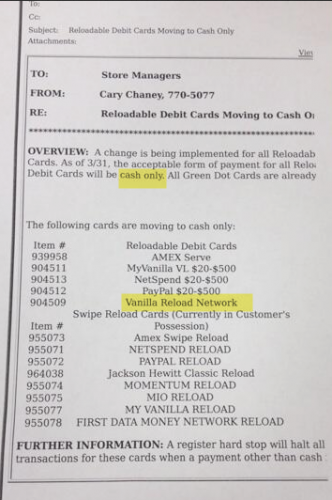 Are Vanilla Reloads At CVS Coming To An End? *This post will continue to be updated. Update 3/31 – 10:30PM EST: There is a new memo that looks similar to the one above, however this one specifically mentions credit card fees as the reason behind the cash-only change. Also, this memo says that the chain rollout will happen by 4/4/14. Check out this map made by ZapperO that anyone can contribute to. This map displays what CVS stores had VRs purchasable with a credit card and which didn’t. You should definitely check it out. Update 3/31: There are reports of CVS prompting cash only – here and here (there may be more). Other people are having no issues at all this morning, so this is still very YMMV. What’s important is that the registers are not hardcoded, yet. So, get them while you can! Also, if you do go out to CVS these next few days, please participate in this Flyertalk survey. This memo has been floating around Flyertalk since yesterday. There has been a lot, and I mean A LOT of speculation on whether this is real, an April Fool’s joke, or something else entirely. Whatever it is, it has definitely stirred up the community. This is not a definitive thing, but here is what we know. Cary Chaney is a real person and he deals with prepaid cards at CVS. There have been reports on Flyertalk that this is only a regional thing in Florida. There have also been reports from people (with low post counts) that they have seen the memo in CVS stores on the east coast. I checked my local CVS and they have not heard or seen this memo. This memo does not specifically mention OneVanilla cards, so that may still be an option. It does not mention Vanilla Reloads in particular it just says “Vanilla Reload Network Swipe Reload Cards (Currently in Customer’s Possesion). The item number does match up with CVS’s Vanilla Reloads though. So, it may just be worded poorly. Everyone is up in arms about this change, but it’s not the end of the world! There are still many other ways to manufactured spend. In fact you can still use your Bluebird account, by swipe reloading at Walmart. I love the ease of Vanilla Reloads, however every good thing must come to an end. If this turns out to be a real change, we will just have to adapt. That is how the points and miles world works. If you want to see everyone else’s thoughts on this matter, check out this Flyertalk thread (the last 30-50 pages). My suggestion would be to stock of on Vanilla Reloads today, just in case this turns out to be real.